Volunteers are involved in all aspects of our work and in all our projects: delivering workshops, tour guiding, researching our archive, cataloguing, reception, admin work, literacy and numeracy tutoring and much more. We always try to find a volunteer role which matches our volunteers’ interests and motivations. Some volunteers come with particular skills, others may not have worked before but are keen to learn and try new things. Whatever our volunteers’ experiences and skills, we are keen to find a way to involve them in our work. Volunteering at Glasgow Women’s Library from Glasgow Women’s Library on Vimeo. Our Volunteer Programme is rooted in our Core Values and ensures women from all walks of life can contribute and get involved in our work. All volunteers receive a full induction when they start, ongoing support from staff and more experienced volunteers, and training as required. The support we offer is tailored to each volunteer and takes into consideration their motivations for volunteering, whether that’s to meet people, learn, play an active role in the community or share skills and knowledge with others. You can read more about our current and previous volunteers’ experiences here. We also refund travel expenses (up to £5.00). An awareness of equalities issues: racism, homophobia, disability issues, mental health issues, the impact of violence against women etc. There is no set requirement in terms of volunteers’ time commitment, this ranges from a few hours per month to a full day per week. In addition, we would ask volunteers to make time for an induction (1.5 hours) and to attend one of our regular This Is Who We Are sessions (3 hours) to find out more about our history, values and work. Women of colour or women from an ethnic minority. Like all our women-only activities and events the Volunteering Programme is inclusive of Trans, Intersex, non-binary and gender fluid people. We also prioritise applications from women who have already visited us and are already familiar with our work, through borrowing books, attending events, groups or exhibitions. You can find out how to apply at the bottom of this page. We are of course aware that our recruitment policy might be a disappointment for those who do not fall within our current priority groups. Here is some additional information about how we have made this decision. We are extremely grateful for every offer of help and support we receive. We would love to involve an indefinite number of volunteers in our work but, sadly, we simply do not have the capacity to offer opportunities to everyone who is interested. Ensuring our volunteer team reflects the diversity of Glasgow’s communities and brings together women whose paths may not otherwise cross, so that they can share experiences and learn from each other. 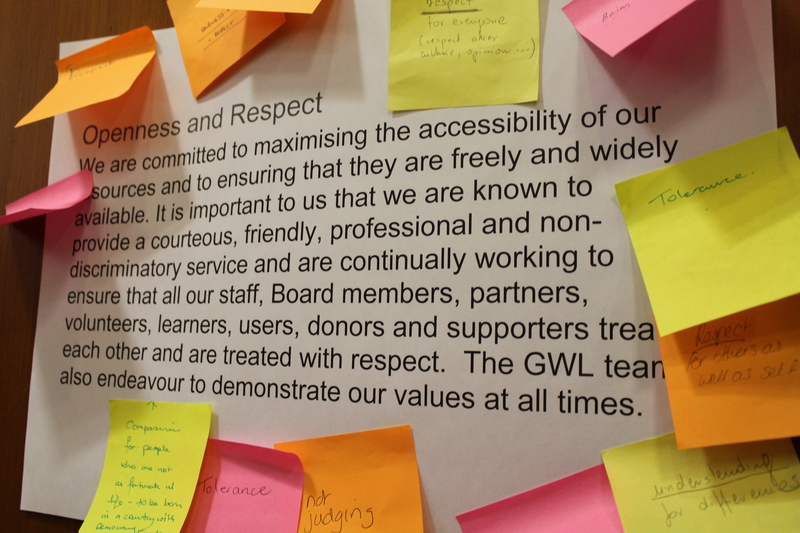 With these aims in mind, and following a review of the diversity of our current volunteer team, we have therefore decided to prioritise applications from the priority groups listed above. This policy will be reviewed regularly, so please visit this page again if you are still interested and available to get involved. And we would love you to get involved and support our work in other ways and have listed some suggestions below. We love the enthusiasm of our supporters and hope that you’ll be interested in some of the other ways you can get involved and support us if you are not able to apply to join our Volunteering Programme. 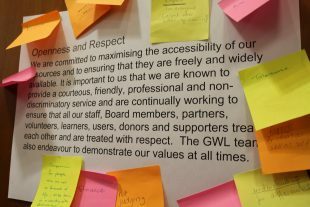 Come Along to a Regular Event: If you’re wanting to make friends, have a regular GWL date in the diary, or just want to see what we have to offer for the first time, we have a variety of groups that meet regularly at GWL. All are friendly, inclusive, and usually offer lashings of tea! Check out the Story Café, our monthly Creative Writing Support Group, fortnightly Women Making It or regular Seeing Things trips. You can download an application form and email it to info@womenslibrary.org.uk or post it to the address on the form. When completing the form please don’t feel you have to share any personal or sensitive information which you are not comfortable sharing, and be assured that any information you do share is treated in the strictest of confidence and is only used in order to make volunteering as enjoyable and beneficial to you as possible. For example, you might wish to tell us that certain situations can make you anxious, or what adaptations we can put in place to make volunteering possible. This kind of information helps us to tailor a role which is best suited to you and is flexible to your needs.